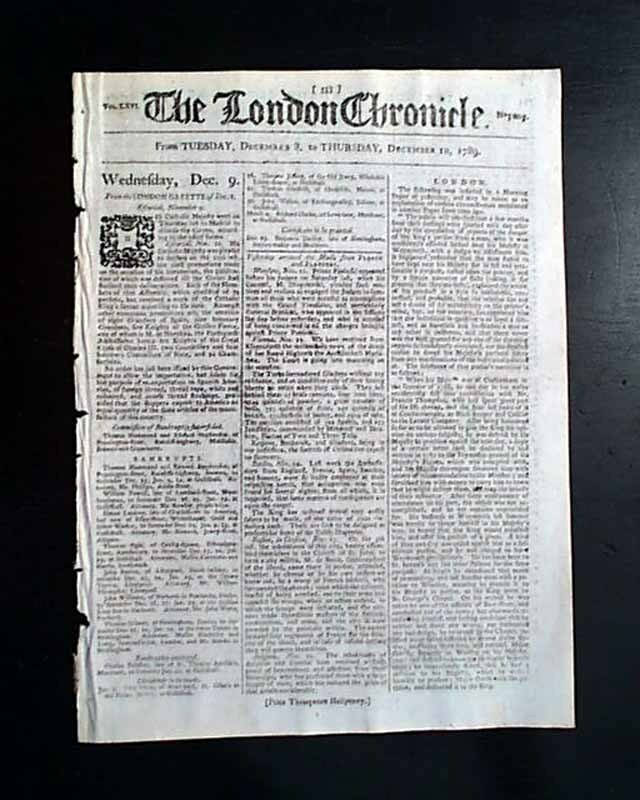 THE LONDON CHRONICLE, England, December 10, 1789 The first and second columns on page 7 contains the report of George Barrington's trial at Old Bailey (see background below). 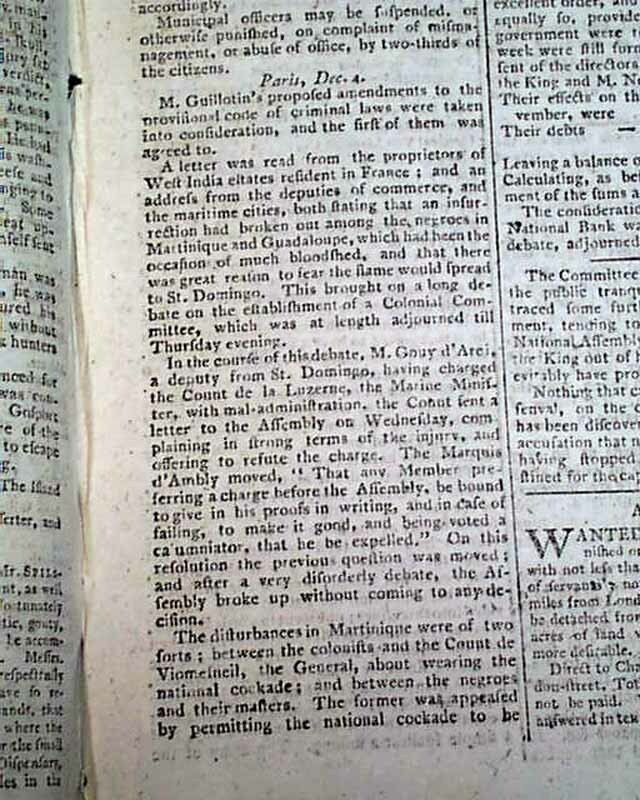 Page 3 also describes a slave revolt in Martinique which includes a letter from the former (?) slaves signed: "All The Negroes." 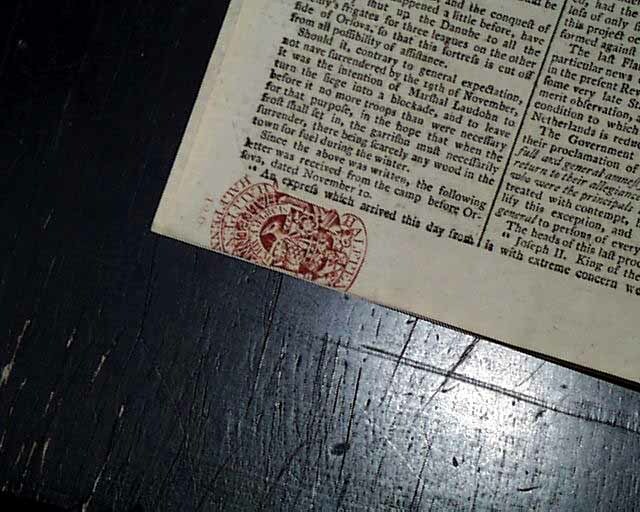 The letter states: "We know that the King has made us free; we expect to be so. If giving us our liberty be opposed, we will spread fire and blood through all the colony. 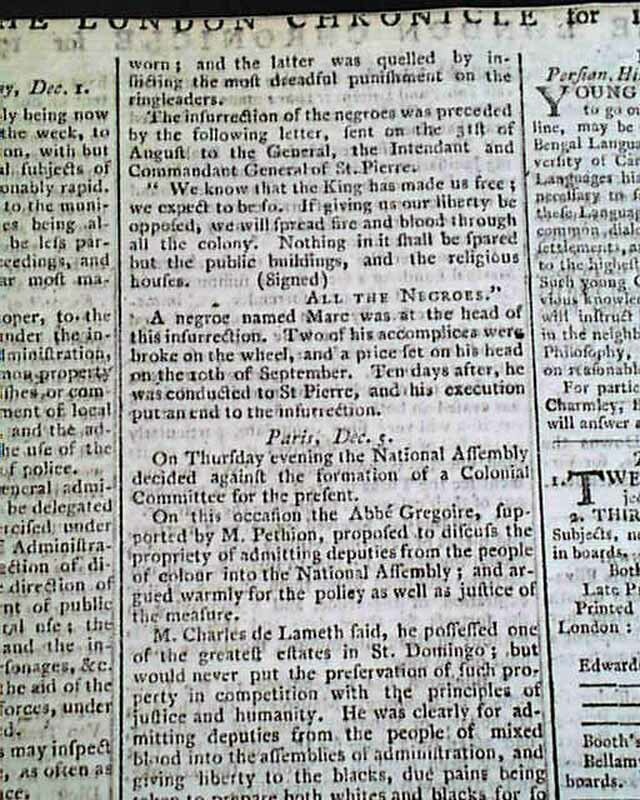 Nothing in it shall be spared but the public buildings, and the religious houses." 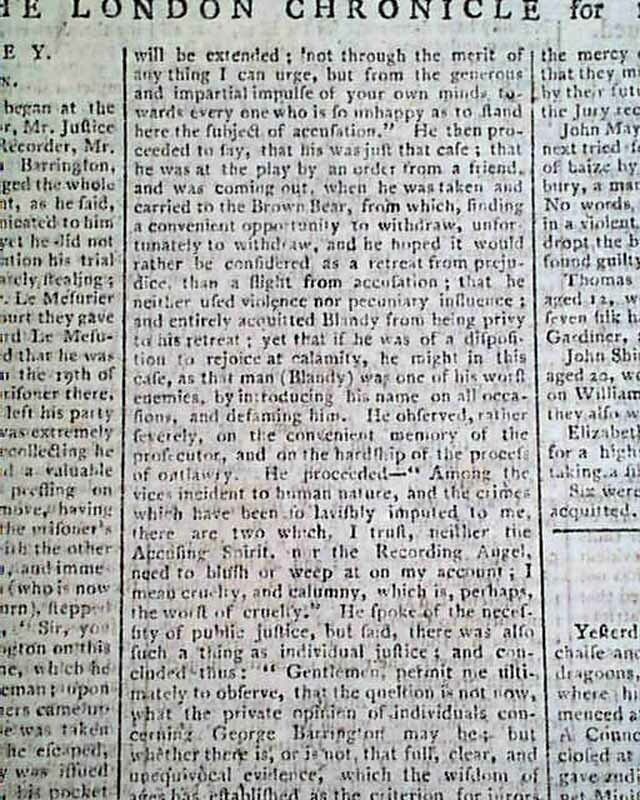 The insurrection subsided upon the execution of their leader (Marc) and the "discipline" by the wheel of his accomplices. Complete in eight pages, partial red ink tax stamp, minor spine wear, otherwise in nice condition. 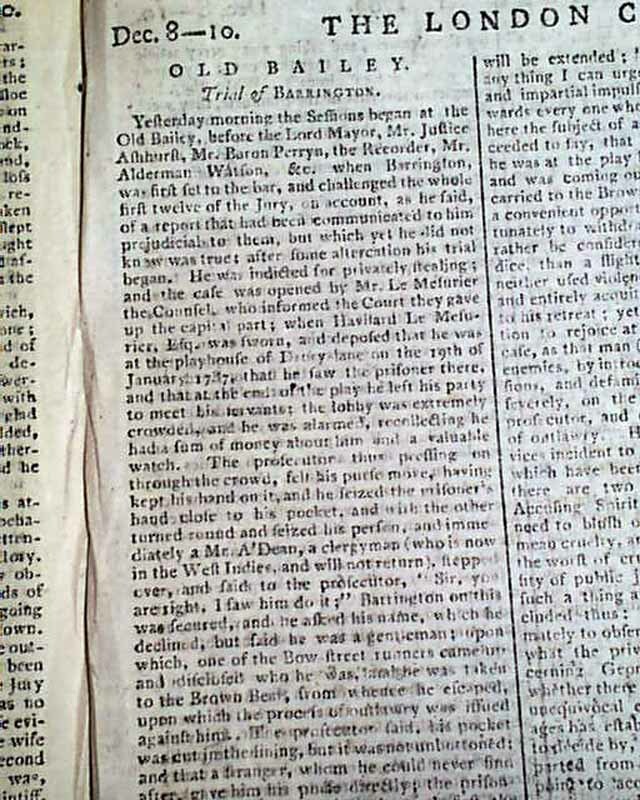 Background (source - Wikipedia): George Barrington (14 May 1755 – 27 December 1804), an Irish-born pickpocket, popular London socialite, Australian pioneer (following his transportation to Botany Bay), and author. 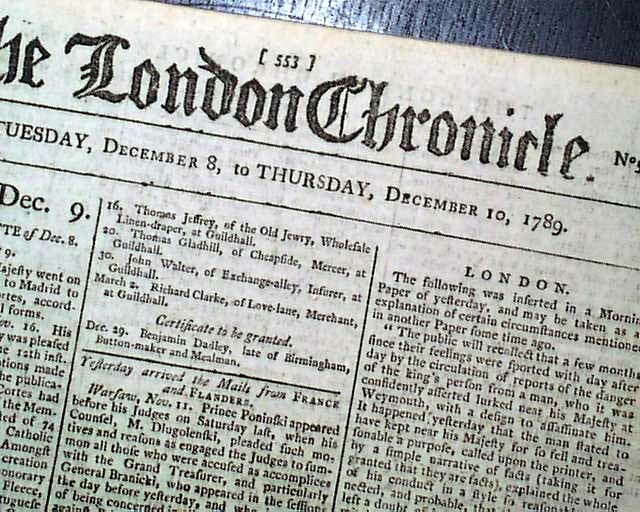 His escapades, arrests, and trials, were widely chronicled in the London press of his day. For over a century following his death, and still perhaps today, he was most celebrated for the line "We left our country for our country's good." The attribution of the line to Barrington is considered apocryphal since the 1911 discovery by Sydney book collector Alfred Lee of the 1802 book in which the line first appeared. 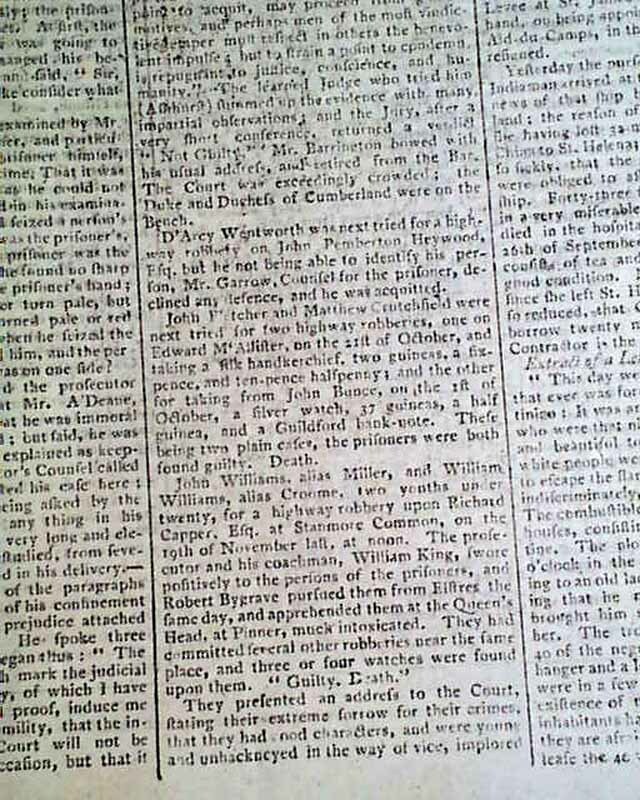 At Botany Bay - One account states that on the voyage out to Botany Bay a conspiracy was hatched by the convicts on board to seize the ship. 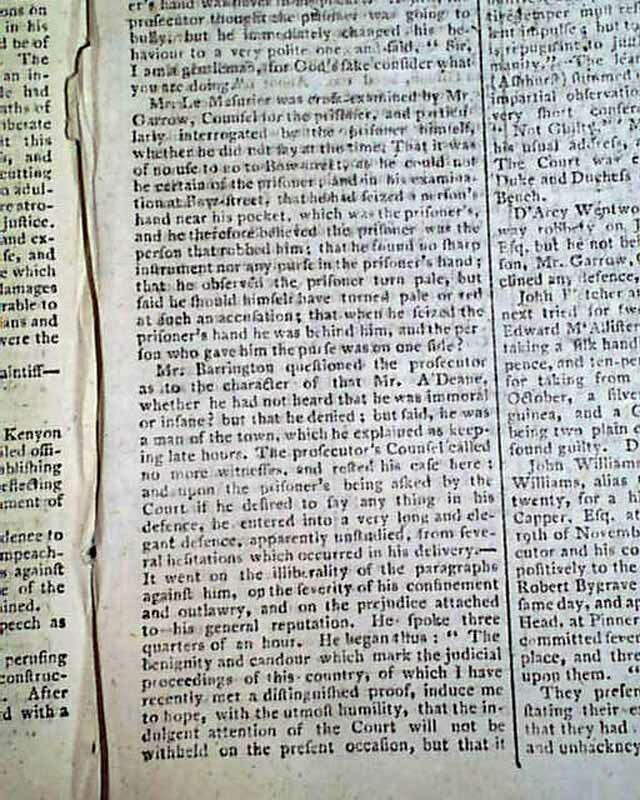 Barrington disclosed the plot to the captain, and the latter, on reaching New South Wales, reported him favourably to the authorities, with the result that in 1792 Barrington obtained a warrant of emancipation (the first issued), becoming subsequently superintendent of convicts and later high constable of Parramatta.